Ricotta salata combines many of these flavors into one delicious cheese. It’s slightly salty, though not as salty as feta cheese and not crumbly, and a little spongy. I had it recently at Cafe Ino and decided to use it to make a quick appetizer at home for a dinner with a friends. Before going to Cafe Ino, I thought of bruschetta as bread, tomatoes and basil – Cafe Ino got me thinking outside of the box. As an aside, Cafe Ino has so many different variations of bruschetta using a wide range of fresh ingredients, all of which are veggie friendly and which I never would have imagined on bruschetta. There’s usually a pretty long wait, but it’s it worth the wait for a good glass of wine and simple dinner of bruschetta and paninis. Including prep time, this takes about 20 minutes, but you can do the prep of cutting the cheese and tomatoes ahead of time. My sister suggested toasting the bread a few hours ahead of time, letting it cool down and then storing it in a sealed freezer bag – apparently, it retains its crunchiness. We followed our bruschetta appetizers with a dinner of white bean stew and bucatini with eggplant. Slice the bread into 1/2 inch rounds. Cut the cheese wedge into thin slices (they’ll be triangular if the cheese is sold as a wedge which is fine). Slice the tomatoes into 1/4 thin rounds. Spread the bread slices onto a cookie tray covered with aluminum foil and use a cooking brush to spread olive oil over each slice. Put them in the oven on low broil until they are golden on top being careful to not let them burn or get too crunchy. 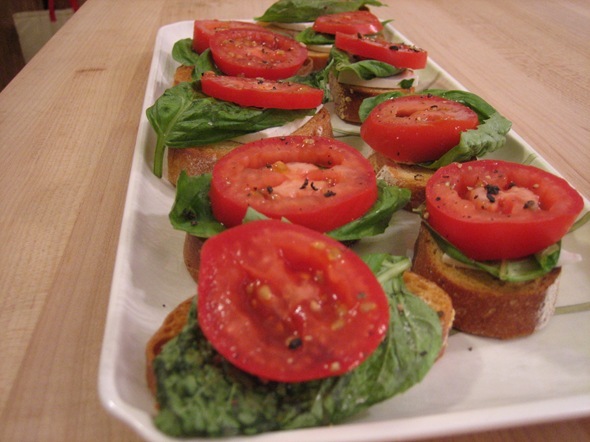 When you are almost ready to serve, assemble each piece of bruschetta by placing a slice of ricotta salata, then a basil leaf then a slice of tomato on top. Sprinkle freshly ground sea salt and black pepper on top to taste. If you don’t have enough basil for one leaf per piece of bruschetta, then stack the leaves on top of each other, roll them up from stem to tip and then thinly slice.